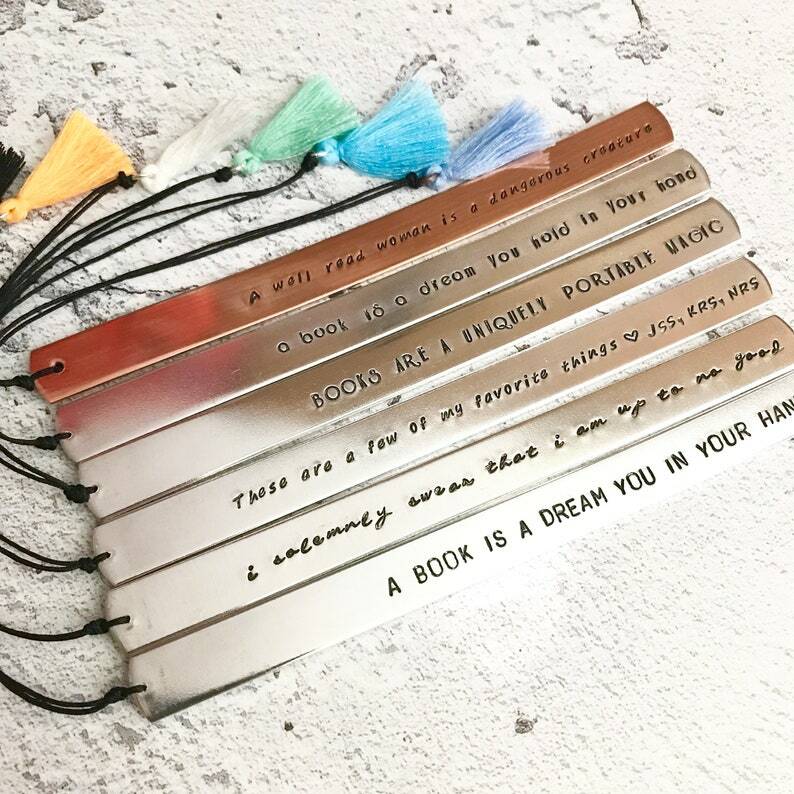 This is a beautiful Hand-stamped Aluminium book mark, stamped with your favorite greeting, quote or just a cheeky message & finished with a cotton tassel in the colour of your choice. ADD YOUR PERSONALISATION IN THE NOTES TO SELLER BOX UPON CHECKOUT. This bar measures approx 150mm x 12mm and can be personalised with anything you wish. Please send us a message with your choice of words, please do check spellings, we will stamp exactly as it is sent to us. We can fit a maximum of 45 characters (including spaces & grammar) per bookmark. Black or natural letters are available, just add your preference in the notes to seller box upon checkout. As standard we send with black. Please note that these items are hand-stamped meaning that I stamp each letter one at a time, so each letter will have varying degrees of depth, alignment & unpredictable spacing between them. PLEASE MESSAGE ME WITH YOUR PERSONALISED DETAILS. If you do not provide us with your personalised information this will delay your order. Please read through all policies before ordering for information on production times & FAQ. By ordering this item you are agreeing to all of our policies. ALUMINIUM: A soft metal that is a great price alternative to Sterling Silver. Aside from being low in cost, aluminum does not tarnish - If the metal becomes dull or dirty it can be easily wiped away with a lint free cloth / silver cloth. This soft metal, however, is not as strong as Sterling Silver & continued bending & twisting will weaken the metal & inevitably break. This item came super quickly and it was perfect! Amy was a pleasure to deal with and responded to my questions quickly. I highly recommend this seller! LOVE the custom bookmark I ordered for my best friend. The craftsmanship looks great and it arrived nicely packaged ready to gift! It surprisingly shipped SUPER fast too! As our items are handmade to order meaning that there is a slight delay in postage, we ask that you allow 3-5 business days for items to be made & posted. Having said this we en-devour to get them shipped as fast as possible & in most cases manage next day dispatch. Customs policies & import duties differ for each country. Unfortunately we will not know if items ordered by our customers will be subject to import duties as they're only charged once the parcel reaches its destination country. If your parcel does incur an import charge, this must be paid for by you the recipient. We are happy to cancel and refund your order providing it has not yet been dispatched. Once it has been posted, it will be too late for us to do this. Please note this does NOT apply to personalised items, due to their nature once work has started on them we cannot cancel the order as they are deemed unsaleable. We take great care to ensure that each of our pieces are accurately depicted in the listing photos & descriptions. However, please be aware that on occasion some items may differ slightly to those seen on our site, due to each being unique & colours may appear different on screen. MY ORDER HAS ARRIVED AND THE TEXT IS NOT PERFECTLY ALLIGNED, I DONT LIKE THE LAYOUT, CAN I GET A REFUND? Our items are crafted & finished with traditional hand tools & individually hand stamped, one letter at a time. Small differences in spacing, depth & alignment will naturally occur & add to the story of each piece. This is not considered a defect but rather part of its unique charm & character. Lay out of items will be how I see fit whilst working unless specifically instructed by you. Please do check the fonts available in the listing pictures for examples of each one, each has its own unique style. We cannot be held responsible if you do not like it one completed. MY ITEM HAS ARRIVED AND IT IS SPELT INCORRECTLY / DIFFERENT TO THE DESIGN I ORDERED, WHAT DO I DO? Personalised Items ordered incorrectly will not be refunded or exchanged as they are deemed unsalable, we make them exactly as ordered, so please do check your spelling & grammar before ordering, once production has started on your piece it is too late. However should a mistake occur during production (something that is different from the specifications given at the time of purchase), we will happily replace the item & ship it to you free of charge or refund you. I HAVE PLACED MY ORDER AND WISH TO CANCEL, CAN I GET A REFUND? Sometimes production time is extremely short, and we could be working on your piece shortly after ordering. If we have begun work on your personalised piece we cannot offer a refund, however, if work has not begun on your piece we can refund your full order no questions asked. MY ITEM IS NOT THE CORRECT SIZE HOW DO I FIX THIS? Please check and double check the sizing on your items before placing an order. If we have sent the size ordered, we cannot be held responsible if it does not fit. For some items we may be able to resize them, however all postage & additional costs will be down to the customer. MY ORDER HAS ARRIVED & I HAVE CHANGED MY MIND, CAN I SEND MY ITEM BACK FOR A REFUND? If no mistake on our part has been made, we cannot give any refunds or replacement on personalised items as they are made specifically for the customer and their own pre-agreed specifications & thus deemed unsaleable. For non-customised items, we hope that you love your items but in the event you are unhappy with anything we are happy to offer you a full refund (excluding postage fees). Your items must be returned to us in it's original condition & original packaging within 14 days of purchase. We reserve the right to refund your item if it is not sent back to us in it's original condition. Any damage & loss will be covered by The Bead Pot. Photographic Evidence will need to be provided for damage and loss off items. Procedure as stated by the delivery company must be adhered to. Refunds will ONLY be issued to items deemed either Lost or Damaged. Damage caused by an individual such as the customer will not be covered. Items with incorrect spellings will not be replaced, please check all spellings and proofs sent. To arrange a return please first contact us with your full name, address, order date & order number including a description of the problem. Please be aware we do not accept, faulty goods or exchanges without prior consent so please be sure to contact us and await a response before sending any returns. Return postage is at the customers expense, please do ensure that the correct postage is paid as we are unable to accept returns that do not adhere to this. We recommend that you obtain a proof of postage & ideally recorded delivery as we cannot be held responsible for items that do not reach us. When filling out customs please mark it as a return as any costs occurred will come off the refund. Jewellery Damage may occur with wear depending on the PH of the body & the circumstances of wear; in the shower, pool, etc. As such, exposure to such elements will not warrant any exchange or refund. We can offer a free repair for any damages within 1 month of purchase (excluding user breakage or damage mentioned above) after this time it is deemed to be natural wear and tear and there will be a small charge. I do not accept returns due to the natural tarnishing of metals as it is easily cleaned off. We use 1st class postage as standard within the UK. For international orders we use Royal Mail international standard, THIS IS NOT TRACKED. For shipping to ITALY, this is now Tracked only, there is no standard option, unfortunately every single item was getting lost in transit so we have had to change to this option. MY PIECE HAS BEEN DISPATCHED, HOW LONG WILL IT TAKE TO ARRIVE? Delivery Estimates are given by Royal Mail, so please be aware that these are subject to change - due to holiday rushes, custom checks & bank holidays. We cannot be held responsible for this nor will we provide any compensation. Please note that this does not take into account if items are stopped by customs & this may cause a delay which we cannot be held responsible for. HOW LONG WILL MY ORDER TAKE TO MAKE? We specialize in handmade, personalized pieces & as a result, all items are made to order. Our current production time is 1-5 working days (excluding weekends & UK bank holidays). please note that at busy times of year (christmas) orders will take longer then usual so we reccomend that you plan ahead and order early. I’M IN A RUSH FOR MY ORDER, CAN YOU SEND IT SOONER? In short NO, we aim to create all orders as quickly as possible & often send out well within the estimated time frame. Please understand that handmade items take time to create, especially personalized pieces & we want your piece to be perfect! To be fair to all of our customers we do not offer a rushed service & cannot guarantee that we can prioritize your order. MY ORDER IS LOST, WHAT DO I DO? It is rare that items become lost within the postal service. Please understand that once orders are dispatched, they are in the hands of Royal Mail and we have no control over the handling of your items. If you choose to upgrade to tracked, then you will have been sent your tracking reference upon dispatch. Sometimes there can be a simple delay with the postal service that affects your order. If items have been lost/misplaced by Royal Mail delivery service, please contact us to discuss refund/resend and the time scales to do so. WHY DID I RECEIVE A NOTE STATING I MUST PAY A CHARGE TO PICK UP MY ITEM? Unfortunately, customs, tariffs & duties may be imposed by certain countries for overseas purchases. These are at the responsibility of the buyer. Please check with your custom offices for detailed information. MY ITEM HAS BEEN DISPATCHED BUT I HAVE PUT THE WRONG ADDRESS, WHAT DO I DO? Before ordering please check your shipping address. If the address given to us is incorrect we are unable to offer any refund or resend your order if already dispatched. If you catch us in time we certainly will change the address for you before posting. I’VE ALREADY ORDERED, CAN I CHANGE MY ORDER? Once your item is purchased, we cannot guarantee that we will be able to alter your personalisations. Please read ALL information before purchasing including delivery information. If there are any issues with your order, or you have failed to provide us with the correct information, we will contact you via Etsy Conversation. If we do require more information in order to make your piece & you have not replied by the maximum production time we will extend the dispatch estimate by 30 days & contact you again. If you still have not replied to our messages regarding your order by this extended 30 days, we will cancel & refund in full the items we are unable to create. I CAN’T QUITE FIND WHAT I’M LOOKING FOR, DO YOU DO CUSTOM WORK? Yes, I love custom work, if you can't quite find what you are looking for please do message me & I will do my best to work with you to create the perfect item for you. I DON’T KNOW WHAT MATERIAL TO CHOOSE, CAN YOU GIVE ME MORE INFORMATION? ALUMINIUM: A soft, versitile and lightweight metal that is a great price alternative to Sterling Silver. Aside from being low in cost, aluminum does not tarnish - If the metal becomes dull or dirty it can be easily wiped away with a lint free cloth / silver cloth. This soft metal, however, is not as strong as Sterling Silver and continued bending and twisting will weaken the metal and inevitably break. Aluminium is perfect for bangles and bracelets because it's rare that it causes a reaction making it ideal for wearers with more sensitive skin. COPPER: A hard metal that has a lovely earthy red colour. Known for it’s possible medicinal benefits. Copper can cause slight green discoloration of the skin, this is due to the metal reacting to the natural acids in your skin & the oxygen in the air. As Copper does oxidize quickly, it often has a darker appearance, which can be removed easily with a Copper cloth / Sunshine Cloth / Pro Polish Pad to reveal its beautiful red finish. To care for your copper, a good tip is to use a very small mixture of water, vinegar and a tiny bit of salt to clean. Make sure you polish it regularly using a polishing cloth to remove any residue. SILVER PLATED: Silver Plate is described as "covering something with a thin layer of silver" all of our silver plated items have a base metal of either either brass or steel which are then copper coated & then silver plated, these contain less then 5% nickle which is compliant with EU legislation. To care for your silver plated cutlery, it's always best to hand wash and not use a dishwasher. Don’t let it come into contact with stainless steel as this can cause corrosion as the metals react. Ensure you dry each piece by hand and use a flannel cloth and specialised silver polish (or a silver polishing cloth) to maintain the lustrous shine. STAINLESS STEEL: A super strong and hugely durable metal. Stainless steel is hypoallergenic making it ideal for people who tend to have a reaction to other metals. Stainless steel will not rust, tarnish or stain and retains its high shine with little effort on your behalf. To care for your stainless steel, all you need is warm water, a cloth and dish washing soap. After cleaning, simply polish it lightly with a dry cloth to remove any water spots. WILL MY PIECE RESIST TARNISHING? All metals may mar or scratch with wear/friction & will age over time based on frequency of use. They may also tarnish or damage depending on the PH of the body & the circumstances of wear; in the shower, pool, prolonged sun exposure, during sleep etc. I'VE ACCIDENTALLY SNAGGED MY CHAIN AND IT HAS BROKEN, WHAT CAN I DO? Unfortunately small accidents happens, and even though our delicate pieces are designed to be worn everyday, they are not indestructible. If you'd like, you can send your piece in for repair and we will re-fit new jump rings and chain, if required, and send it straight back out to you. Please do contact me before sending out your piece, I can then help with instructions & the best way to send your piece to us along with a custom quote & timescale. - Polish your jewelry after wearing to remove oils, fingerprints & dust. - Keep your jewelry as dry as possible. Do not store it in a humid environment. - To keep your jewelry nice and shiny, store it in a re-sealable plastic bag with anti-tarnish paper. Make sure your jewelry is clean and moisture free before storing. - Do not wear in the shower/ swimming pool /hot tub. Chlorinated water can react with the metals causing color changes and even structural damage. - Remove jewelry before any vigorous activity, before sleeping & when performing manual tasks (kitchen work, gardening, cleaning the house) to prevent physical damage or exposure to chemicals or cleaning fluids. - Put jewelry on after applying makeup – Cosmetics, hairspray, perfumes and lotion can contain chemicals that can often damage jewelry. - These metals will naturally oxidize/tarnish over time, due to exposure to air and oils from our skin. - If you want to restore the shine, remove LIGHT tarnish stains and build-up from your jewelry piece, use JUST a polishing pad (foam square with micro-abrasives already built in). Silver polishing cloth will not work on copper or brass. HOW TO USE YOUR POLISHING PAD: Gently rub a pad across a piece of jewelry that is completely dry and store your piece in an air-tight plastic bag. When cleaning chains, hold by the clasp and do not tug at the chain or you risk breaking the clasp. -The "black" in your hand stamped items is patina, it may wear off over time and exposure to certain elements. However, you can take care of your items to prolong the life of the patina. - To clean your handstamped jewelry, simply polish with a jewelry cleaning cloth. - HAND STAMPED jewelry should NOT be cleaned with any jewelry cleaning solution, as the solution can rub off the oxidation (patina) that's in the letter indentions. - Avoid submerging your jewelry in water, cleaning supplies or chlorine pools. - Avoid exposing your jewelry to household chemicals when cleaning with bleach or ammonia, or when swimming in chlorinated water, as these chemicals can damage silver. Perfumes, hair sprays, and profuse sweating can also cause a quicker formation of tarnish. - REMOVE AT NIGHT. Do not sleep with plated jewelry, night sweat and the extra rubbing against the skin will cause the plating to wear off faster. - STORE LIKE ITEMS TOGETHER. Do not put away gold plating and silver plating together. The different metals will cause each other to tarnish, fade and/or turn colors. Store in a dry, dark area. - DO NOT CLEAN WITH CHEMICALS. Plating is much more delicate than pure metals, chemicals will fade the plating. Clean often to keep shine and remove sweat & dirt that will cause items to fade. Use a damp cloth and wipe down gently, use a clean towel to dry. When cleaning chains hold by the clasp and do not tug at the chain or you risk breaking the clasp. Measure your wrist with a flexible tape measure by wrapping it just below the wrist bone (SNUG fit), where you would normally place a bracelet or watch. For a snug fit, add 1/2” to the size; for a looser fit, add 1” to the size. This is not a guarantee for a perfect fit, but it is what most people recommend. You assume full responsibility when giving jewellery to a child, as the jewellery may contain small parts that are not suitable for kids. Please note that any custom work I do may be added to my shop at my discretion. This means names, dates, or quotes that are sent in may be photographed & listed. MY QUESTIONS STILL AREN’T ANSWERED, HOW CAN I CONTACT YOU? If you have any questions or queries please do not hesitate to contact us via Etsy.